Because @SimonPetrikov mentioned Cowboy Bebop I must say this. Go watch it, do it for me, do it for good ol’ RMB. It’s only 26 episodes, yet a complete work of art that will likely leave its mark on you. You’re gonna carry that weight. @RMB, why you gotta do that to me fam. These fvcking onion ninjas are everywhere and i havent even gone back and rewatched it just the thought of that beautiful anime and how it should have been gifted the length of life Naruto got if only to keep its beauty going made them swarm to me. @AllThanks, they made it exactly as long as it needed to be, and that’s what I like about it. No overstayed welcome, and a conclusive ending. @RMB, Does it have a proper ending? 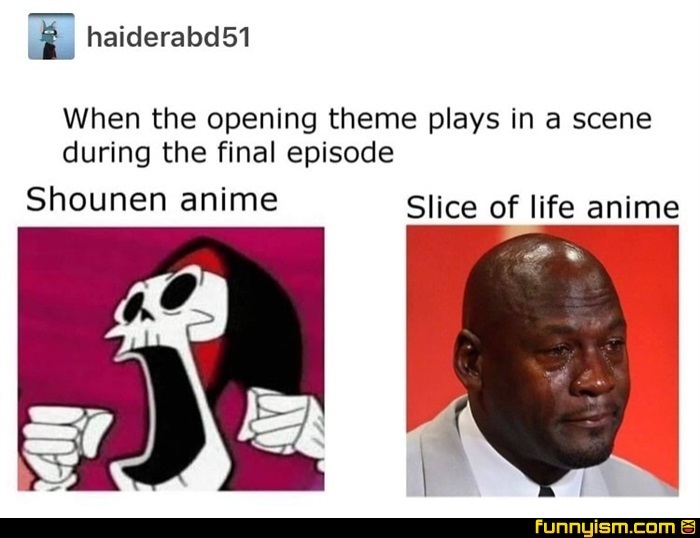 I’m new to anime and everything I’ve watched so far has had a weird/pointless/non-existent ending. Bleach - no ending FMA - I’m confused, he’s in London now? Ranma - nothing resolved at all Neon Genesis - ????? @Nellybert , it has an amazing ending. And fma movies are a continuation or something I think? Like the sacred star of milos. But I prefer brotherhood as it’s canon. @PippyPie, if you don’t mind paying, vrv isn’t bad cuz you get crunchyroll and funimation. If you’re not trying to pay you can always try kissanime or 9anime. @RMB, I feel like I'm gonna get crucified. But I was in there for that show. And then Ed showed up and I was out. @Zerker Shark, Brotherhood had a better ending - which is understandable since they’d actually finished writing the manga by that point. I felt like you needed to have watched FMA first as it gave a lot of back story that Brotherhood skimmed over (the mining town and preacher bits), but Brotherhood definitely had the better ending. @RMB, is it an anime or what? FMA: Brotherhood did it a couple of times and each time it was fantastic. @mako mark, YOURS IS THE DRILL THAT WILL PIERCE THE HEAVENS! So I have to be honest, besides Cowboy Bebop I never gave anime a chance. So I picked a random one and came upon Peach Girl and started watching it. Lo and behold, the main character was dealing with the same exact issue I was dealing with at the time (a friend who was copying me, talking sh*t behind my back, trying to get any guy I liked). The story was good. If anyone can recommend a similar anime to that one, please let me know. Gurren Lagann, Your Lie in April, Cowboy Bebop, Fullmetal Alchemist all of them absolutely beautiful and wonderfully crafted. But... the series that has made me cry the hardest, Sword Art Online. Holy sh*t! Season 2’s ending... damn dude that sh*t with seriously stay with you!